ENC,4BAY, eSATA, W/DP5+, Black, RoHS - CRU-DataPort's eSATA 2 DataPort and 4 DataPort Subsystems provide ultra-reliable SATA storage in a compact all-metal chassis. 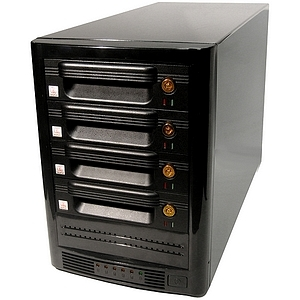 Featuring rugged DataPort V plus removable drive carriers for easy disk replacement and data archiving, any capacity 3.5" half-height Serial ATA drives can be used. The host connection is straightforward with SATA Signal Extend internal-to-external cables, PCI mounting brackets and a shielded 1 meter SATA cable per drive included.